Well, you just begin from where you are right now! 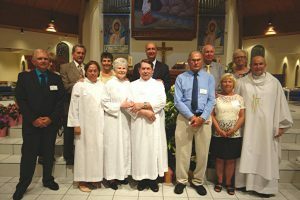 Many adults who are entering the Catholic Church, or even those who are thinking about it, follow a process called “R.C.I.A.” (Rite of Christian initiation for Adults). For information please see the information folders available at all church entrances. Still interested or have questions contact John Raymond john@aplusconsultingnow.com, even if you are an adult baptized Catholic but haven’t received 1st Holy Communion or Confirmation. You can also call the parish office at 941-497-2931 and leave a message and John will get back to you. Although our first session took place October 3rd, 2018 at 7PM in the Education Building Room 7&8, sessions continue every Wednesday: same time, same place. If you are interested in becoming Catholic stop in for any session. If possible, please fill out the RCIA Application form and email it or bring it to the parish office. Want to wait to start from the beginning next year? 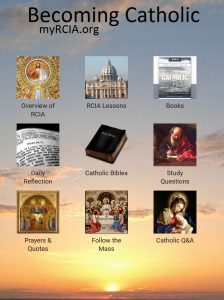 Get started now with the free online RCIA series and join us next year in October way ahead of the curve. See this TV Commercial on the Catholic Church produced by Catholics Come Home who have a great message for those who are considering a return to the Catholic Faith – Come Home! Don’t come back alone. Visit the Journey Home Network to connect with those from all walks of life who have already made this journey. Our new Catholics for 2016 after the Easter Vigil along with their sponsors. Those dressed in white are the former Catechumens now Baptized, Confirmed and have received their First Holy Communion. Also, pictured in the front row are the former Candidates along with our current Parochial Vicar Fr. Martin Koziola. 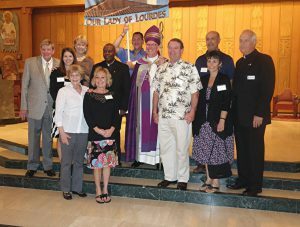 The second row are the Catholic Godparents for the former Catechumens and Catholic sponsors for the former Candidates.